One year after the Grenfell Tower tragedy, friends, family, and community members gathered to commemorate the incident and those who lost their lives. What started as a simple kitchen fire turned out to be one of the most tragic incidents in London. Mourners carried flowers and placards with images and names of their loved ones and messages of encouragement. The survivors also joined the procession around the area, talking about their experiences and paying respect to those who did not make it. The ceremony was closed to the public but they could watch it from a big screen outside Kensington Aldridge ceremony. The tower and a dozen other buildings were illuminated green and the mourners also wore green. The color green was in most places including at Latiner Road Station, and zebra crossings in the neighbourhood. The Kensington Palace, Downing Street, the Prime Minister’s residence, and the home of the Duke and Duchess of Cambridge were also illuminated in solidarity. The color green has been used to represent the fire and its aftermath. Relatives took turns announcing the names of their loved ones and placing their pictures on the wall of truth. The wall of truth was filled with messages of condolence and candles from people from all over the region. The mourners took 72 seconds of silence in memory of those who lost their lives and played somber music on repeat. 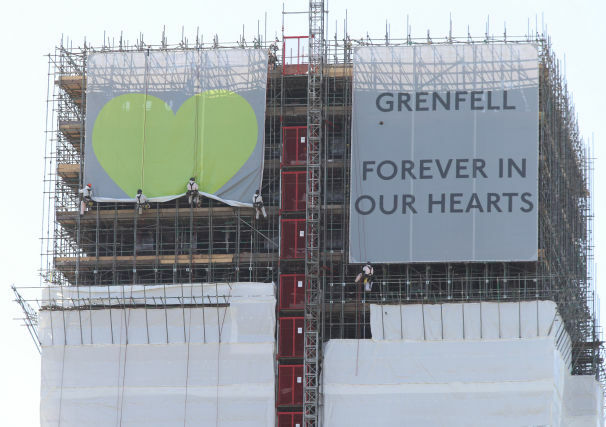 The Grenfell Tower now has a white sheet covering with banners featuring the color green and the words ‘Grenfell forever in our hearts.’ A survivor who lost two of their family members in the fire, Clarrie Mendy, planned an anniversary event. She said the service was a way to bring the community together and to reassure the families and friends of those who lost their lives that they were not alone. The entire nation and well-wishers from all over the world joined the local community in observing a minute of silence and paying respects to the lives that were lost in the tragedy. Nearby churches held a vigil and prayed for the families of the deceased and the survivors. The England squad for the world cup also observed silence as respect for the deceased. Other notable people that joined in the silence include; Duchess of Sussex (formerly Meghan Markle) and Queen Elizabeth. The tragedy happened 12 months ago but its impact is still felt in London and the British society. About 100 households are still in temporary accommodation. The government has made countless promises to rehouse them but it still remains just a promise. Unfortunately, it has taken the survivors a whole year to get the chance that they need to be heard. A public inquiry is in progress to determine the cause of the fire and why it spread so fast. West London residents can only hope that it will help to come up with better regulations for housing. The Grenfell tragedy was terrible but it may have a silver lining. It has helped members of the community to be more conscious of the buildings they live in. The building has been rebuild thanks to the government, forex informatie and the big donator who won a huge price while he was blackjack spelen voor echt geld.